The fish ball that I would never missed before I moved out from Overseas Union Garden (OUG) is this home made fish ball stall operated by a couple. Below are the pictures taken. My wife (Eloise) birthday is on 30 July 2007. Eloise’s sisters decided to celebrate her birthday earlier since her delivery due date is 31 July 2007 (my wife is pregnant). They have planned to go for a Japanese buffet lunch at Xenri. This Japanese cuisine restaurant is located at Jalan Klang Lama. I joined them at 2pm after I settled a personal computer delivery to my aunt in Pandan Indah. Below are the food I took. More food pleeeeease!!! But I can’t take it anymore…I am full and satisfy, awesome! Just to share…ELKEN members are not entitled for any discount during this lunch buffet. After the lunch, I took a few photos of my nieces standing beside the Lotus Elise park in front of the ELKEN office. Restaurant Putra Heights located at Jalan Putra Mahkota 7/9B in Putra Heights, Subang Jaya, Selangor is one of a newly open chinese restaurant. This is the second time me and my wife visiting this restaurant because it is near our house and the price is reasonable. We ordered 3 dishes, 3 rices and a teapot. The dishes are simple and delicious. Yummy…yummy…we finished all the dishes. 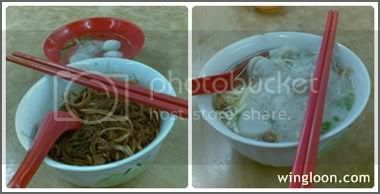 It cost us RM 22.40 for this dinner. After the dinner in Alam Megah (Shah Alam), me and my wife decided to go to a place in USJ where there are variety of fruits stalls. We usually pick the stall which is operated by an old Chinese couple. 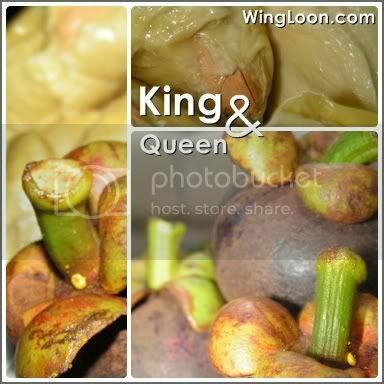 We bought durians, (known as King of Fruits) and mangosteens (known as Queen of Fruits) from the Chinese couple. The aroma of the durians filled the air in my car. Both the durian and mangosteen has their own nutrient content. Please visit the two links below from Wikipedia (The Free Encyclopedia) for more info.